The Gaming Addict Studios team truly appreciates it's players. Without you, there would be no CotG! We realize that the greatest asset we have for growing our playerbase is you; and the bigger the playerbase, the more fun the game will be for everyone! 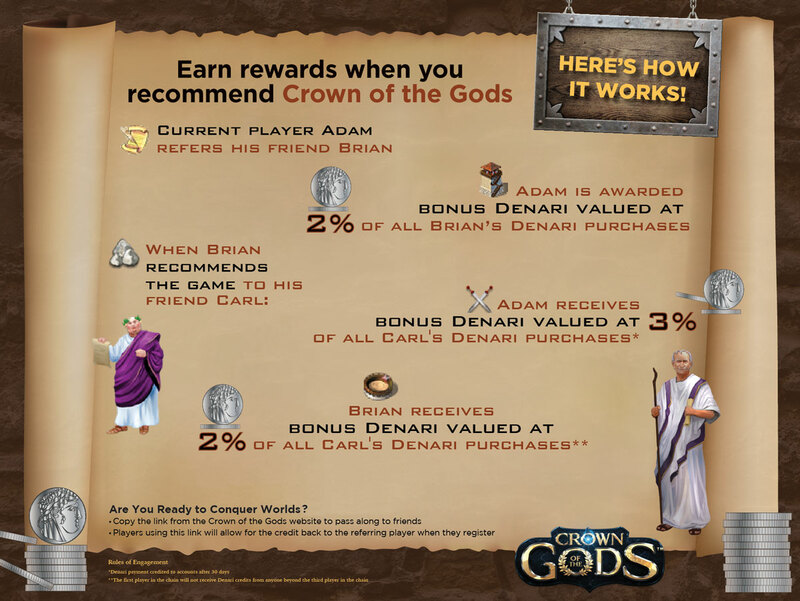 As such, we are implementing a very unique way of rewarding our players for recommending and promoting Crown of the Gods. Other games may give you a one-time bonus for bringing in a new player, but we prefer to let you share in CotGs success as it grows bigger and better. The link below is unique to you, and only you. Spread it around wherever you would like. Social media, MMO discussion boards, native language review sites, gaming circles, or anywhere else you would like. Anyone who registers an account after visiting the site via your link, will be linked to your account! We thank you for being a part of Crown of the Gods and helping it to grow bigger and more exciting for everyone! Give your friends this link to visit our website through, and when they register an account, you will earn a percentage of all their future Denari purchases, forever! If your link is not used by your friend to visit the site and register, their account will not be linked to yours! This can not be changed, so it is important your friends use your referral link in its entirety. Additionally, once your friends start spending in the game, you can start receiving special friend referral items! Friend referral items do not cost any Charisma to use!